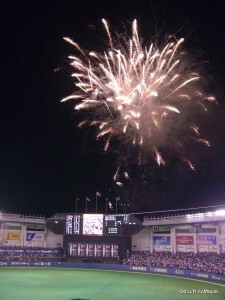 On Saturday, August 16th, I went to my first baseball game in Japan. I went to see the Tohoku Rakuten Golden Eagles VS. the Chiba Lotte Marines at Chiba Marines Stadium. The stadium is about 15 minutes away from the station, but it was a nice walk. Unfortunately, I was covered in sweat by the time I arrived at the stadium due to the hot and humid Tokyo summer. I went to the game expecting nothing. Being Canadian, you’ll always hear me talk about how great hockey is and how it’s probably the greatest team sport in the world. However, after a few innings, and a beer or two, I was starting to enjoy baseball. Rather than watching teams fight it out as hard as possible, it’s more about strategy. Both teams have their own cheering section out in the outfield. Obviously, the Marines side was full, and the Eagles side was half empty. I had a good view of the outfield stands sitting in the upper deck to the right of the catcher. Each player had their own special song. While some were almost the same, some were very distinct and very easy to learn. It is impossible to describe it, but the chants definitely made me want to cheer for the Marines. Buying beer was so easy. Eating at the stadium was also a very new experience for me. We were allowed to bring our own food in. That’s very strange for me as I’ve never seen it happen in Canada. Maybe a small snack, at most, but never food. The only thing you couldn’t bring was beer, I think. However, that problem is easily solved. With at least 20 or more different high school girls, and some boys, running around, you can buy any kind of beer you want. Dressed in their brand’s uniform, they have a backpack full of beer and a stack of cups. Just raise your hand, ask for a beer, and give them money. All fresh and cold. The only problem is when the beer you want is on the other side of the stands, or no where to be seen. Then you either wait, or buy another brand. I was also a little ignorant about food in Japanese baseball games as my only experience is watching “Mr. Baseball” with Tom Sellek. (Fun movie to watch, but very dated and I doubt it’s accurate) I was half expecting to see people eating bowls of ramen or udon, but I was informed a long time ago that this was, indeed, a false image. It’s generally kakikori (Japanese style snow cones) and beer. I must say, I love the beer girls. The game I went to was a night game. Apparently it’s a special type of game. We were a little sad at first thinking the mid-game fireworks would be cancelled. However, the weather held up a little and we had a nice short fireworks display. Around the 7th inning, the stadium starts to come alive in a different way. By now, the chants are all the same and you start to get sick of it. However, you start to hear a whistling sound. People are filling balloons with air and there is a small plastic device at the mouth of the balloon. Once released, the balloon will “scream” as it rises into the air. Both sides release the balloons, but obviously the Marines side had more fans. It’s fun to watch, but a big pain to clean up afterwards. Beware of falling balloons. By the end of the game, the chanting from the outfield gets louder and louder. People are jumping up and down, flags are being waved. The team is pushed and encouraged to win at all costs. Down, 2-0, at the bottom of the 9th, the Marines bring in a pinch hitter, Benny. I thought it was a bad choice. Benny struck out leaving only 1 out remaining. In the end, the Marines lost the game and everyone went home. It seems like the gods knew the Marines lost. Before the end of the game, there was thunder and lightning. As we were about to leave the concourse, it started to pour. 30 minutes later, things were nice and we could head home. It was a great night, and a great experience. It would have been better if the home team won. This entry was posted in Baseball and tagged baseball, Chiba, Chiba Lotte Marines, Chiba-ken, eagles, golden eagles, Lotte, Lotte Marines, Marines, rakuten, Rakuten Golden Eagles, Sendai, Tohoku, Tohoku Rakuten Golden Eagles, tokyo by Dru. Bookmark the permalink. Hi, I’m Italian. My name’s Stefano and also I saw my first match of baseball in Japan. 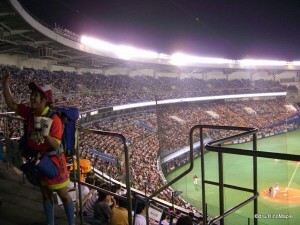 I saw in the 25 th of August 2007 Chiba Lotte Marines vs Tohoku Rakuten Golden Eagles in Chiba. I remember every things.In that mach the situation is 3-1 for Chiba in the 8th inning. In the 9th inning Eagles maked an homerun and they maked 3-3. 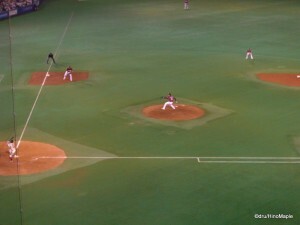 In the extra inning Chiba won 4-3. It was beautiful and I bought a Jacket of Chiba Lotte Marine like a souvenir. I tasted zaru soba and it was very good. I’m happy to know a person who saw a match how me. Excuse-me for my English. And I’m happy to know you are from Vancouver. Next year it’ll be the Winter Olympic Games after Turin. And it’ll be beautiful about opening cerimony. Good blog and good luck for the future. Thanks for reading my blog. I’m happy to hear someone also went to see the Marines, but watch them win. I might see more baseball in the future, so keep reading my blog. I hope Canada does well in the Winter Olympic Games. Should be exciting. Thank you for your comments. Good luck to you as well.